Christmas was coming and for the first time, my parents were visiting my home. Naturally, I was both excited and nervous. So, I made sure everything was clean and tidy and of course decided to make them a hearty meal. The love of baking bread, made me want to make something a tad fancy. It is Christmas after all. My requirements for foods on holidays is that it be beautiful, hearty, easy and not keep me from my guests. Therefore, it amused me to find that brioche making fit well into that category. One note, a mixer/kneader would be a good idea for this recipe (Or really strong arms). Brioche is a French bread that requires at least a 24 hour waiting time. After the initial first rise, you must let it sit in the fridge for at least 12-24 hours. The yeast’s growth is retarded but the flavors develop into a wonderful buttery rich tasting bread. This is a definite must try! The best part, is because of the long rise time, you can make this a day ahead and there is only a minimal amount of work to do, the day of. This leaves plenty of time for me to spend with my guests and still serve fresh hot bread. Combine all ingredients and knead for 15 minutes on medium speed, in mixture until dough is shiny and elastic. Punch down and cover dough again and refrigerate for 12-24 hours. Form the larger pieces of dough into larger balls and place into a muffin/cupcake tin. 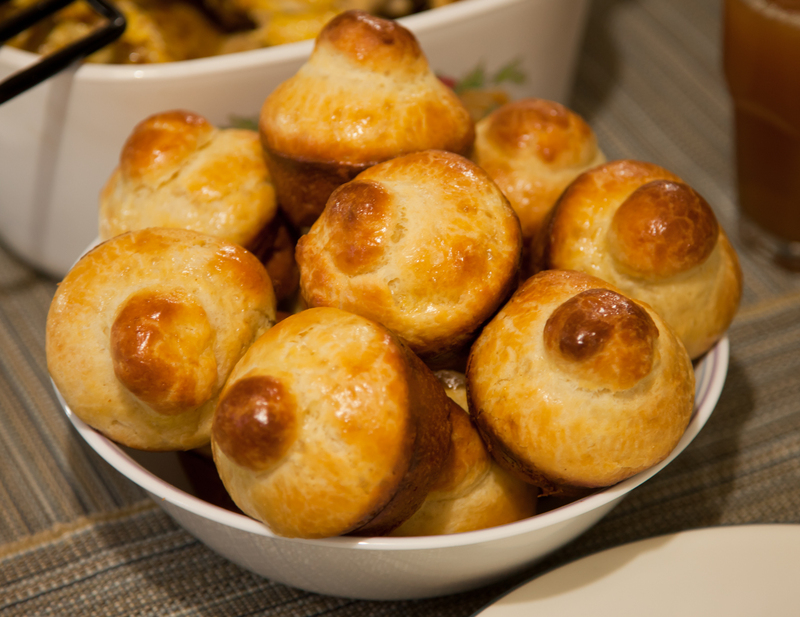 Cover muffin tin and mini dough balls with a towel and allow dough to rise for 2 hours. Glaze large dough balls with whipped glaze mixture. Glaze the top of the rolls again. I LOVE brioche sooo much, but normally it’s a pain to make, and it takes forever. I’m defiantly going to try your recipe! Brioche is definitely one of my favorite breads to make now 🙂 I hope you enjoy it! Thank you for visiting my blog!